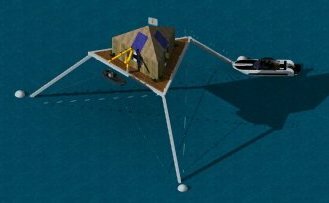 Our mission is to develop a solar powered ocean platform suitable for a single family to live on and so stable it is more like a floating island than a typical boat. I tested 3 models in train formation with a better joint between them. The first with 3 floats rolls much more so I like the quadmaran design better. The joint is very simple. On the back of one model is a piece of wood with a screw head sticking out. This can be thought of as a trailer hitch except that it is aimed back instead of up. The front of the other boat has a piece of wood with a small hole drilled in big enough for the screw head to fit into. Then rubber bands are connected from the posts on the sides of the models to pull them together (keeping the hitch connected) and also keeping the models lined up straight, but with plenty of flexibility. The little sandbags are to simulate the weight of the lead batteries that would be above each float in a full sized solar powered version. On each side there are 2 rubber bands chained together. They are stretched to about 18 inches. At rest they are 8 inches. I measured 0.64 lbs pull when stretching one to 18 inches. I also measured 1.12 lbs pull at 28 inches. Close to Hooke's law. This model is 1:16 scale, so full sized would be 16 times in each of 3 directions, or 4,096 times the displacement or mass. So if the rubber bands here are 0.64 lbs pull, in full scale it would be 0.64*4096=2,621 lbs. This is small enough that it could be done with a hand winch and a stretchy rope. Blow is a video. Be sure to notice how the boat in the upper right is tipping as much or more than my tiny lightweight models are. If these models were scaled up 16 times in each direction, so 4096 times heavier, they would hardly move in these waves.